The Iraqi Embassy, Berlin, Germany: In 1969 Iraq was the first non-communist country to recognise the DDR and enjoyed a strong economic relationship until 1990. Amid tensions during the First Gulf War in 1990, the Iraqi Embassy hurriedly cleared out it’s quarters in Tschaikowskistraße. 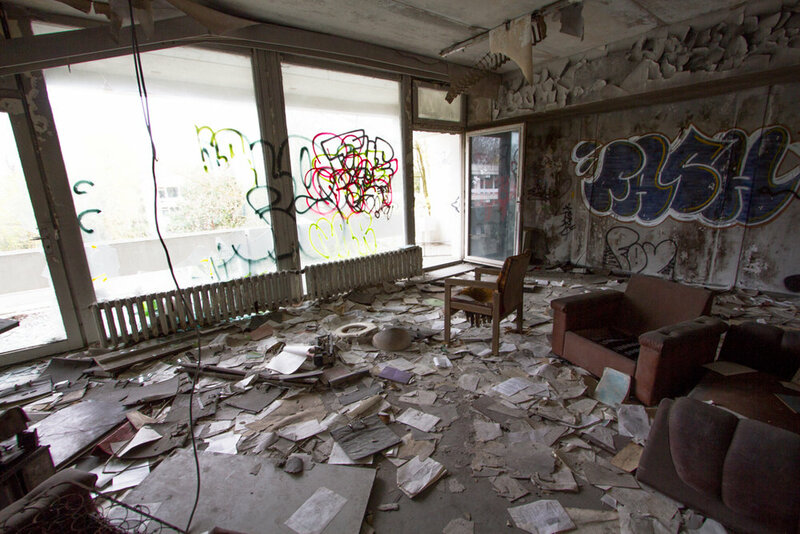 To this day, the embassy sits abandoned and uncared for, the floor scattered with personal information. Munitions Factory, Tiraspol, Transnistria: As the last remaining Soviet state with its own military, government, laws and currency, Transnistria was disowned by the international community in 1992 when it broke away from Moldova. It is famously known as a country "that does not exist". In the outskirts of the capital of Tiraspol, a munitions factory sits abandoned. As an industrial steel hub during the Cold War, Transnistria has been often accused of illegal arms trade. In 2015, Deutsche Welle reported that over 20,000 tons of ammunition and weapons are still stockpiled within its borders. Chisinau State Circus, Chisinau, Moldova: Moldova fell apart at the end of the Cold War as Transnistria broke away as a separate state taking the majority of industry with it. Today, it is the poorest country in Europe, and for those who have fallen short in capitalism and corruption, many remember the Soviet era with the nostalgia of better living conditions. Chisinau State Circus was built in 1981 and closed down due to unsustainable economic conditions in 2004. With capacity for up to 2,000 people, the building was a hub of entertainment and circus glory drawing artists from across the USSR. Pripyat City, Chernobyl Exclusion Zone, Ukraine: A devastating accident in 1986 at Chernobyl Nuclear Power Plant put this region onto the maps and into history books. Pripyat, a small city of almost 50,000 people were notified and ordered to evacuate after more than 24 hours of the accident. With an average age of 26, Pripyat residents were mostly young families who moved to the area for work at the nuclear power plant. Kindergartens, schools, and parks are strewn throughout the city, with only the footprints of tourists, artists, film crews and a very few stubborn elderly that refuse to leave the land. Ironically, a school is littered with gas masks, not for threat of a local disaster, but threat of nuclear war with the United States.